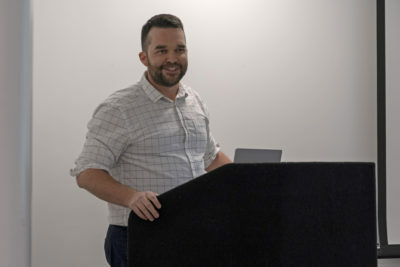 The semester’s final session of the Arts Colloquium Series featured Blair McDonald, a professor of journalism, communication and new media, who presented on the influence of Marshall McLuhan. Faculty members and students gathered in TRUSU’s Board Room on Nov. 21 to listen to McDonald present on the topic: Extending Legacies: Reappraisals of McLuhan’s Understanding Media. Examining a few of McLuhan’s prophetic claims, McDonald discussed different ways in which McLuhan’s teachings could possibly influence future artists, researchers and critics, who now exist in a digital world. McDonald also made reference to McLuhan’s 1964 book entitled, Understanding Media: The Extensions of Man on the future of media. “The medium is the message can be understood as a remarkable shift in media studies away from content analysis– so particular entertainment and media shows– into a discussion of media forms,” he said. He explained that this incorporates everything from print to telephone, to television and radio. Moreover, he added that “how these forms themselves forever change the local landscape of mass communication and the people using them,” must also be taken into consideration. Clarifying some of McLuhan’s ideas on technological determinism, McDonald talked about how technology can shape changes in culture. “Technology shapes cultural change and then cultural changes are primarily caused by changes in communication, so we see that interconnectedness,” McDonald said. He also mentioned that an example of this, which he teaches in his second-year Media History class, shows that the printing press made the creation of books possible. McDonald explained that as a result, mass literacy was then considered an essential component of survival within that particular culture. “It kind of removes the world of literacy and reading information as something which only elites can have and opens it up to the mass public,” McDonald elaborated. The Arts Colloquium Series is an event that allows faculty members to share their research and works in progress. “It is a series that has been going for about five or six years now that is organized by some arts faculty members and it’s to encourage and nurture a collegial environment and culture of research amongst faculty members across campus,” stated Lisa Cook, one of the organizers and an associate professor of anthropology at TRU.